As the days grow cooler and darker, I've accepted the fact that I'll have to do some clothes shopping for winter. Luckily, it will be (almost) guilt-free shopping as I donated almost all of my clothing before I left Canada. I mean, I'd already donated my hair, why not my clothes and shoes, as well??? So, I'm actually in need of a new winter wardrobe. The third phase of The Avenues Mall has been completed and apparently there's a new Sephora AND the Cheesecake Factory. I have fond memories of the Cheesecake Factory, and while I actually can make cheesecake all on my own, I can also appreciate a nice slice of cheesecake that someone else has made :) I'll let you know what happens. I'm off to the Avenues Mall tomorrow to grocery shop. I need more popcorn kernels. Ohhh, yeah. You read that correctly: popcorn kernels! I have made it work: popcorn with butter and seasoning!!! My very first bowl of popcorn in Kuwait: Popcorn (popped in a pot-my uncle taught me how to do it that way), butter and ranch seasoning! Saturday: My flatmate and I met up with (one of) our Georgian co-worker(s). I finally decided to brave a sushi restaurant here. I knew that I was potentially entering rough waters because the idea that a Japanese sushi restaurant owner would venture to Kuwait seems extremely unlikely. I was right. The sushi restaurant, a chain, called 'Sakura' (note the originality of that name, folks! Too much sarcasm? ), was staffed entirely by Filipinos. *Sigh* The maki was interesting and it was okay...But considering the main ingredient in sushi rice seasoning is rice WINE vinegar, you could tell that something was lacking. The wasabi paste wasn't strong at all and it just felt like it was a very bad attempt. *Sigh* However, it looked delicious, so I took pictures, just for you!!! Sunday: My work week began on November 11th, Remembrance Day. I was hit by the onslaught of Facebook pictures and status updates and felt thankful, but I also felt a sadness because I live in a part of the world where war is still a not-so-distant memory. It's eye-opening and it's a good reminder to be grateful for and to the men and women who fought and who continue to serve Canada. I can't even begin to imagine what it would be like...Yes, I'm extremely privileged and naive. It still hits close enough to home though. My mother's father was psychologically scarred after returning home from the Korean War, and my father's uncle was a kamikaze pilot in World War II. Thank God my grandfather returned home. However, my father's uncle never returned to Japan and his whereabouts are unknown, although we're all quite certain he perished during his mission. To those who defended Canada and continue to do so, we will never forget and shall ever be grateful. Although Sunday was a holiday, I still had to go into the office. Have no fear! I made sure I used the time wisely: my flatmate and I meandered over to the college campus to The Coffee Bean and treated ourselves to specialty coffee. We sat outside in the blazing sunlight for a few hours avoiding work and air conditioning! When we finally wandered back to the office, the Irish chef told me he wanted to take me somewhere special. Special? ON campus?? Well, he certainly piqued my interest! He led me to an area full of books and DVDs and I couldn't help but smile: he had brought me to the school library, a place that I thought only existed in legends. Sorry. I couldn't help it. Most Kuwaitis don't read anything unless it's a text message or Facebook. Many people here don't even have an email address. No lie. In the library I wasted even more time browsing...Yes, it's tiny, but they had a boat-load of literary criticism (that was a shock to me! ), and also study books for learning Arabic. I only paused momentarily in that section though, bad Miki! I actually spent time looking at the DVDs and settled on two: A historical look at the Dark Ages and a documentary about the Great Wall of China, which actually CANNOT be seen from space. Am I the only fool who believed that? Sheesh. It was honestly the FIRST thing that scholars clarified, hahaha! Monday: I sucked it up and made an appointment at the dentist. It's only been 7 years...Yes, I KNOW that's bad, but I didn't have coverage and when I did I was still too poor to pay the advance fees. Don't reprimand me, please! At least I made the appointment on my on free will and went! In the evening I had my coatings sanded down and re-filled. It was painful. The dentist kept hitting nerves and even today I while I was drinking tea my teeth hurt-booo! I still have to do the other side of my mouth...Yay. The weird thing about the dentist? The hideous glasses you have to wear are EXACTLY the same make/model as the ones in Canada-no clips on the bibs though. The bibs here tie. Good grief, am I really talking about this?? Tuesday: Nothing crazy happened, it just rained. There was thunder, too. It was nothing special, but watching everyone's reaction to rain WAS interesting! Some of my co-workers even got excited. Many students wouldn't drive to school because the roads. Apparently, when wet, the roads can actually be quite slick because of the sand. Crazy. Many students took pictures and recorded the storm on their cell phones. Others were just plain frightened. Oddly, the sky was never very dark. It wasn't anything to get excited about, but the combination of water-deprived people and rain is truly unique! I wonder what they'd do if they were in Japan during rainy season. 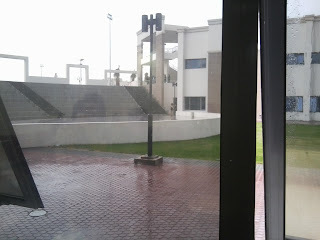 A rainy day on campus (the view from my classroom). Wednesday: I went in to the office early because I was summoned by the HR department; I was to do my fingerprinting and also supposed to give blood...As most of you know, I am paranoid of needles. It's a ridiculous phobia. If I know I'm going to get a needle or give blood, I get anxious and panic. Sweating and shaking usually follow and I get myself so worked up that by the time the blood's been drawn I HAVE to eat a cookie or drink orange juice so I won't pass out-even if they've only drawn one vial. It is THAT traumatizing to me. I can't look at what's happening, I can't talk. I just get clammy and wait in fear...For both the needle prick and the laughter from whoever is drawing blood. I used to use a topical cream to numb my skin, but I could still feel the sensation of the needle entering my arm (UGH! ), so I stopped buying it. Soooo, off to work I went, accepting the fact that I would have to give blood. I went along with seven other teachers/profs and when we first got there I was a bit shocked to see we were simply at an apartment building with armed guards. Unfortunately, the wait was going to be too long, so we all piled back into the cars and the drivers took us to another place. Location #2 was still an apartment building, but at least it looked more like a government facility...Kind of. Anyhow, the third spot looked like a mosque. It wasn't, but that's what it looked like. By that time my cup of coffee, cup of tea and large glass of water were pounding on my diaphragm and I asked our driver if I could use the washroom. He looked at me with an expression that was either one of horror or shock. I'm not sure which it was since he doesn't speak English. Great. He told me to wait at the car and went inside. When he came back out he said that there's only one washroom...For men. Seriously??? I looked at him like, "ARE YOU KIDDING ME?!?" I didn't have to go THAT badly, but I know what NOT going pee-pee can do you, so I started to panic (Isn't it a bit early for that? It's not like he's got a needle, Mik). I took a deep breath, said "Okay," and turned to get back into the car. I think he felt bad because he said again: "Wait! Wait!" Okay, dude. I'll wait. You don't have to yell at me, lol! He went back inside and came back out and directed me to follow him. Immediately, I thought, "Oh, geez. Where's he taking me?" He took me to the men's washroom. Sensing my hesitation he went inside first and said, "It's okay! Empty." Pointing at himself he asked, "I stay?" Uh, YEAH. What would happen if some random guy walked in and I was there alone?!? I looked at him desperately and said "Yes, please." He was not expecting that. "Okay?" He asked. I looked around...It was disgustingly filthy. I couldn't even handle looking at the place. Nope. NOT okay. There were only Japanese-style squat toilets. No worries-I've mastered those-cha-ching! What I couldn't fathom was squatting in filth-covered stalls with not a square of toilet paper to be found. I just looked at the poor guy and said, "No, thank you" and nodded for him to follow me. Poor man. He didn't understand, "There's no toilet paper." I wanted to shower immediately after I walked out of there, that's how disgusting that washroom was, and I think it will forever haunt me. After all of THAT trauma, I never did my fingerprinting or my blood work. Guess visiting my friends in Oman will have to wait. I don't mind being here, to be honest. However, after looking through some photos of the Epp's recent vacation in Oman, I realized that I definitely want to visit my friends there before I leave the gulf for the summer! My friend, who lives in Al Qurum (in Muscat), insists that I visit. It IS beautiful. Look at images/pictures online and see for yourselves! However, the trip to get my fingerprinting and blood work done was not entirely a waste. One of the profs in the car is a nutritionist and we talked a lot about the kind of food I should be eating because (even though I don't talk about it), I'm hypoglycaemic. My mother always said I was hypoglycaemic and continuous problems with my blood sugar levels dropping was always a worry to her. The nutritionist and I talked about what kind of food I should be eating and how to get proper nutrition. I wrongly assumed I shouldn't consume sugar, but that's not the case. Years of catering to my mother and father's diets have left me with a very skewed understanding of my own nutritional needs. It was awesome! She even recommended a whole grain bread, natural peanut butter and sugar-free/low sugar jam sandwiches. Seriously??? My mother wouldn't let us eat pb&jelly sandwiches because they weren't healthy! I'm excited to see how this affects my health and how it will help give me more energy!!! I will keep you posted and let you know how it's going. For now, here is what breakfast looked like PRE-blending, lol! Smoothie ingredients: Laban (liquid yogurt), sunflower seeds, almonds, oats, banana and maple syrup-yum!!! Wednesday night: After a traumatizing morning, hahaha, my flatmate and I decided AGAINST cooking (we both cook quite a bit), and decided to hit-up the Indian restaurant across the street. I have to admit, her chicken tikka masala was waaaaaay better than my butter chicken. Note to self: get the the chicken tikka masala next time! Ohhh, yeah! For my sister: butter chicken!!! I'd already eaten quite a bit by this point, hahaha! The blood thing sounds crazy!! An apartment building??? Wow! When I moved to Qatar we had to go to a hospital to do blood work, and then some immigration center for fingerprints, medical tests etc if I remember correctly. It was fairly easy at least...and there were restrooms! haha. Such a shame about the sushi restaurant. Maybe it was just a bad fluke and there are good ones? If you do ever come to Doha, make sure to try Sushi Minto, Oishi Sushi, Yee Hwa, Asia Live, and Midori Sushi! There are others, but those are just the ones I can think of off the top of my head. Hello Gabek! It was amusing! I think the whole process is SUPPOSED to be easy, but with so many new employees at the uni, it's more difficult. Thanks for the information and I hope you enjoyed a long weekend, too!!! Benihana sounds good. Yee Hwa and Asia Live are the best in my opinion, especially since they have alcohol permits (ie sake!). There are tons of sushi joints around town, so I'm sure your friends could suggest more. I know how you feel about the sushi snob thing. Being half Greek, every time I have Greek food outside of Greece its always a disappointment. Gabek: I'd love to try out the restaurants in Qatar! What are restaurants like there? My best friend is Greek and her family's cooking is the best Greek food I've ever had...I've yet to find a restaurant that makes food like they do, hahaha! By the way, the weather here has been cool and rainy! How about Qatar? I don't know how to describe the restaurants. It has less amount of restaurants to choose from compared to places like Dubai, but the ones that are here are generally very good. Lots of variety as well. I've heard Kuwait has tons of US chains, which sounds really nice. And there are very few Mexican places here, which is annoying. I miss going into tavernas (neighborhood restaurants) in Greece and getting all this cheap delicious food! I heard other parts of the GCC were getting lots of rain, but we only had it for a few hours on Tuesday :(. But the temperature is very cool and breezy, and sunny but not oppressive. Like spring in Seattle. Perfect park weather! Going to walk to the one by my house later today! Some ingredients you just take for granted like rice wine. It took me a bit to connect the problem to a Prohibition situation. Mehhh! Why do you have to give blood and fingerprints? Leah: I hadn't even thought about the rice wine vinegar being the problem until my Polish friend said that the sushi didn't have a kick to it, lol! I knew something wasn't quite right/tasted off, but I didn't even think that they wouldn't allow it until I double-checked, lol! I have to give blood and fingerprints in order to get my Civil ID (residency permit). I did fingerprinting this morning. As for giving blood, I haven't heard any news about that yet. Yay.